Growing up in Jackson County, the Birthplace of the Republican Party, Benjamin cares about the future of the party. Running to give delegates a real choice, Benjamin will put a priority on communications with precinct delegates.. 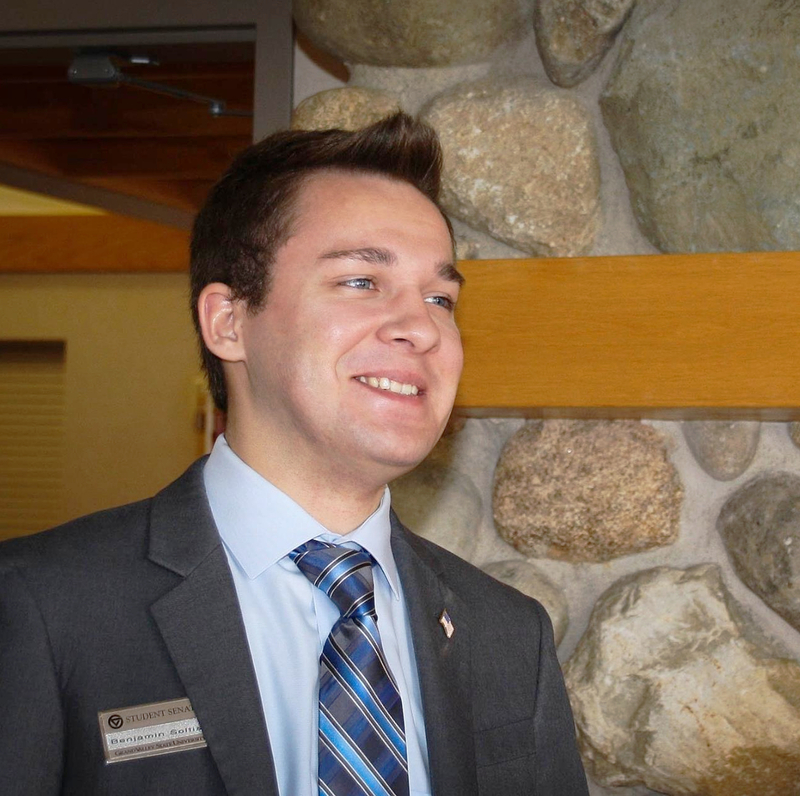 Check out the experience Benjamin promises in service to the Michigan Republican Party when elected. The Outreach Vice Chair has responsibilities listed in the Michigan Republican Party Bylaws. In order to keep the Michigan Republican Party going strong, there is a dire need to Inform. Reach. and Repeat. Benjamin is looking towards making sure Republicans never believe it is too hard to get involved in the party. Are you looking for someone who would never compromise a position for personal interests? Benjamin is the candidate who knows that principle comes before politics in ensuring a fair playing field for Michigan Republicans. The Michigan Republican Party must deal with donations in a special way: Responsibly. Benjamin has dealt with million dollar budgets and knows that the real bang for our buck should be focused on Republican elections. Benjamin works to make technology understandable to non-techies in his career. You deserve someone who will do it unbiased for precinct delegates; cutting through the jargon to make it understandable for the success of the party. Benjamin changes his own oil and fixs his own car. He pay his bills and volunteers his time when he can. He has worked since he was 14 cleaning schools, gauging engine parts, and fixing computers. Benjamin is your average Republican looking to make sure you are able to be involved. Benjamin has participated in Boy Scouts, church groups, and other local initiatives. Always giving of his time and talent, Benjamin started by helping Habitat for Humanity at a young age with his father, Steve Soltis, who was the Executive Director at the time. Through his time in Scouting, Benjamin was given more and more opportunities to do good eventually culminating in a Jackson County-wide Computer Recycling Drive for his Boy Scout Eagle Scout Project in 2011. The project was carried out again in 2013. 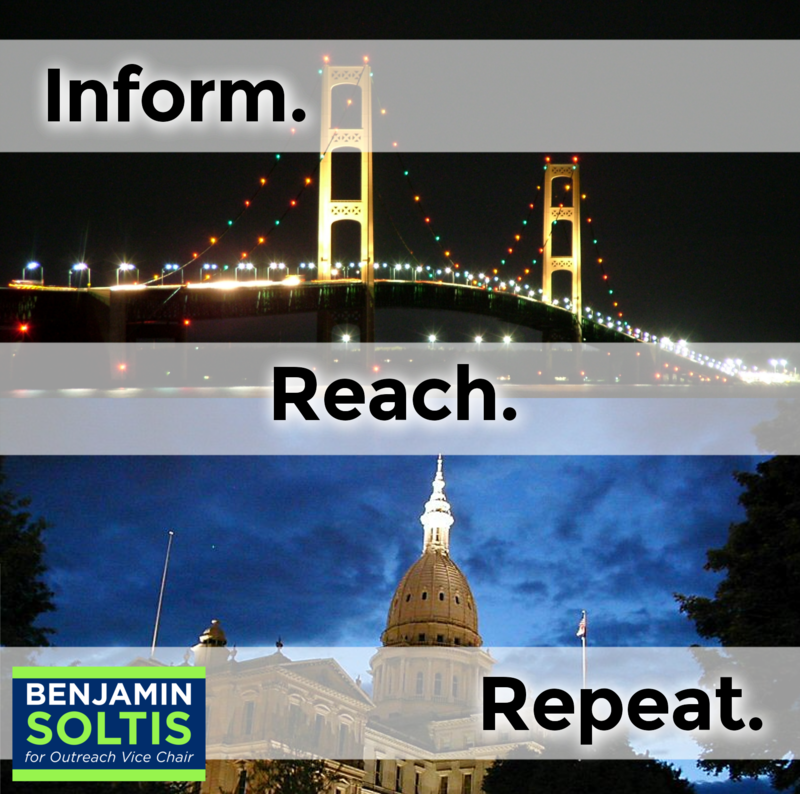 Volunteering in local, state, and federal politics since 2010, Benjamin continually keeps informed of local, state, and national issues affecting Michigan. 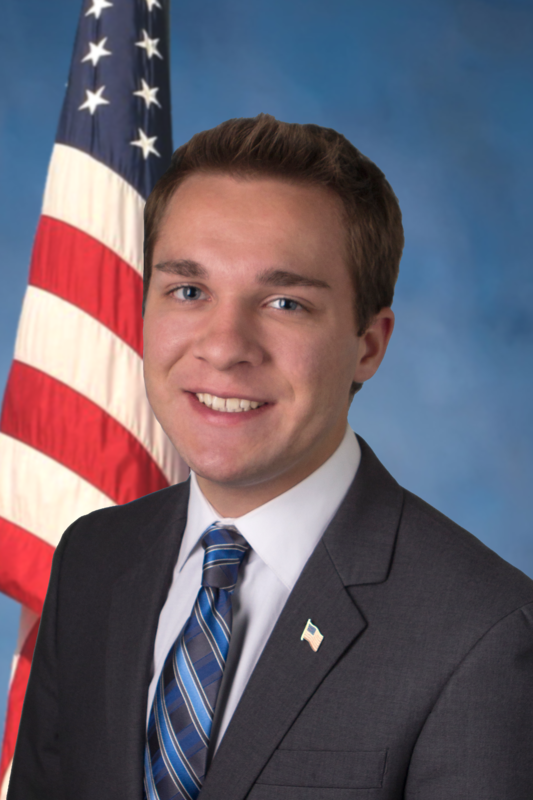 After attending Lumen Christi High School and the Jackson Area Career Center, he spent 4 years at Grand Valley State University specializing in Computer Information Systems and Political Science. 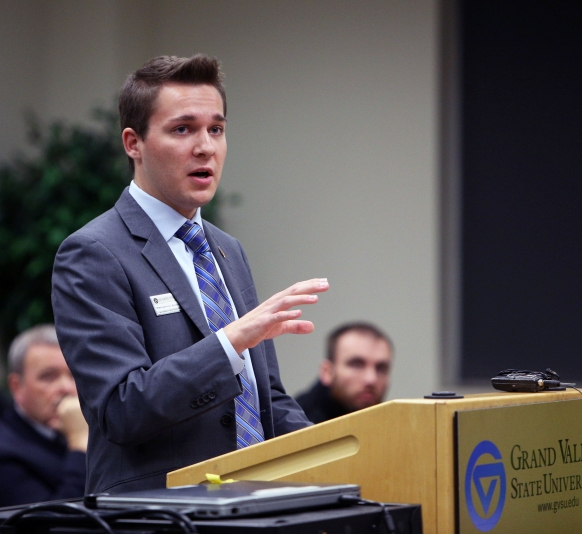 While at Grand Valley, Benjamin was elected a Student Senator from 2014-2016 and represented the student body by standing up for free speech, unbanning pepper spray on campus, and fighting for Constitutional rights denied to students by the university. From 2012-2013 Benjamin represented Michigan as a Michigan Executive Officer in the of Business Professionals of America. With technological certifications earned at the Jackson Area Career Center and 4 years at Grand Valley specializing in Computers, Benjamin now work at Commonwealth Associates, Inc. as an Information Technology Technician. Technological equipment comes easy to him and he take great pleasure in working with others to put it in their language. As an the Outreach Vice Chair, Benjamin would do the same with politics in order to serve Michigan Precinct delegates in clear terms. Make sure current Republicans know how easy it is to be involved in some way with their state, district, or county party. Facilitate and foster relationships with Precinct Delegates in order to stay accessible to the core of our party. November 2016 will go down in the history books. What matters now is how we prepare for the future big races in Michigan. Voting on the state-wide positions is done on Saturday morning on the convention floor. See your delegate and alternate packets for more information. They can as long as they are elevated by a county or district chair to serve in the place of an absent delegate. Drop a message if you have any questions! Officials in the Michigan Republican Party should always be responsive to the the Precinct Delegates!